Ubuntu Developer Summit, more commonly referred to as UDS, will take place from Monday, October 25 through Friday, October 29, 2010 in Orlando, Florida. Every 6 months just after each Ubuntu release UDS takes place, usually alternating between locations in the United States and Europe. UDS is where the Ubuntu developers begin putting together the roadmap to the next Ubuntu release, in this case Ubuntu 11.04, codenamed Natty Narwhal. I am personally looking forward to participating in this UDS and seeing what new and exciting things are being planned and developed for the Ubuntu desktop and server. Keeping in mind that in 6 months time all this planning will surface and you'll see everyone's hard work and contribution on your desktop. If you are using Ubuntu now and want to get involved with the planning of the next release you'll be able to do that as well. Remember out of every UDS comes goals to be completed by all skill sets (developer and non-coder contributors alike). However, I am not the only one looking forward to this UDS --Matt Zimmerman, Canonical CTO posted on his blog earlier today that he was also looking forward to UDS-N.
Zimmerman notes that this UDS will be organized a little differently this time around as they (Canonical) take what has been learned from past Summits and apply that knowledge in a way that will 'reflect the key considerations for Ubuntu today.' He also takes time to outline how the main program tracks are organized. According to Zimmerman's Blog and the Ubuntu Developer Summit site the following is the list of tracks. For more information on the what is being discussed in these UDS sessions next week click here. Just as Zimmerman expressed on his blog - If you are going to UDS, see ya there! 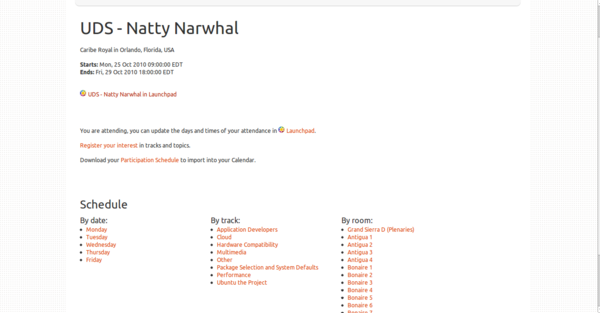 If you can't make it and don't want to miss all the Natty Narwhal planning excitement of this UDS, don't worry, you can still participate through remote participation. My friend and Ubuntu LoCo Council member, Laura Czajkowski wrote a great guide to remote participation. Remote participate is an easy get the benefit of being there without ever leaving your home or office, and with Czajkowski's guide you'll be all set help and participate in planning of Ubuntu 11.04, Natty Narwhal.